With the NBA continuing to expand the types of plays subject to instant replay review, there was justifiable concern that these changes could lead to even longer games. 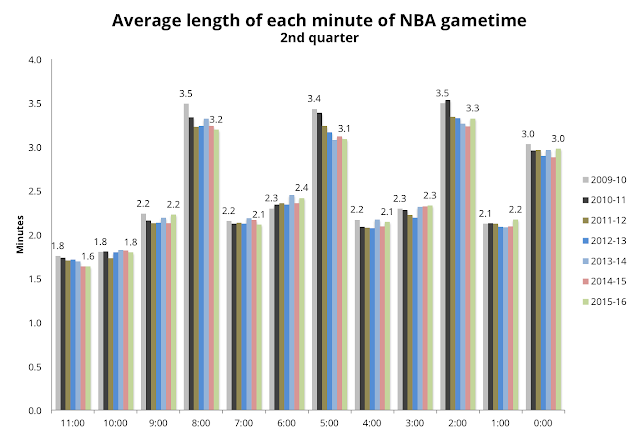 I've done a lot (perhaps too much) research into the length of NBA games and what drives it, starting with a post on the average length of each minute of NBA game time. Subsequent work looked into the difference between close games and blowouts and the length of playoff games. Also check out the "Significant Other" calculator that is part of this site's live win probability graphs. The NBA, never shy with the sharing of data, thoughtfully timestamps each play of every NBA game, which aids and abets all the aforementioned research. For this post, I will use those timestamps to examine trends in average game time, spanning the past six seasons. 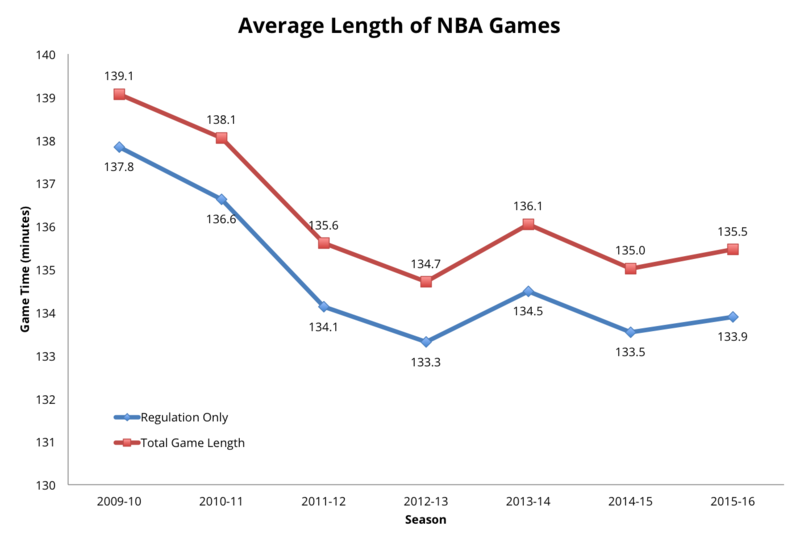 Were the fears of longer NBA games justified? As it turns out, games are shorter than they were just a few years ago. And the expansion of instant replay does not appear to have made a noticeable impact on game length. 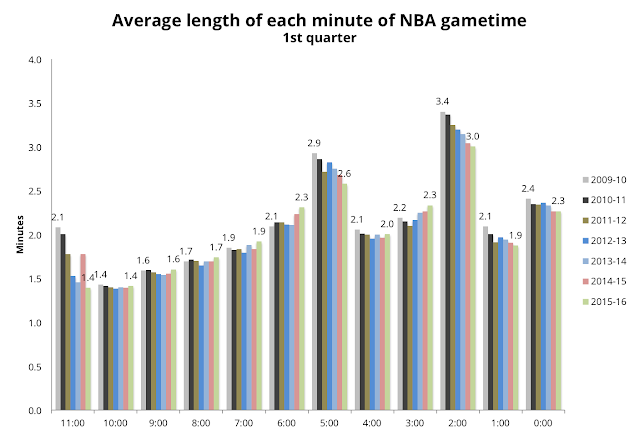 Total game time is charted above, along with regulation game time to see if overtimes were skewing the results (such as this season's quadruple overtime game between the Pistons and Bulls, which lasted 3 hours and 23 minutes). 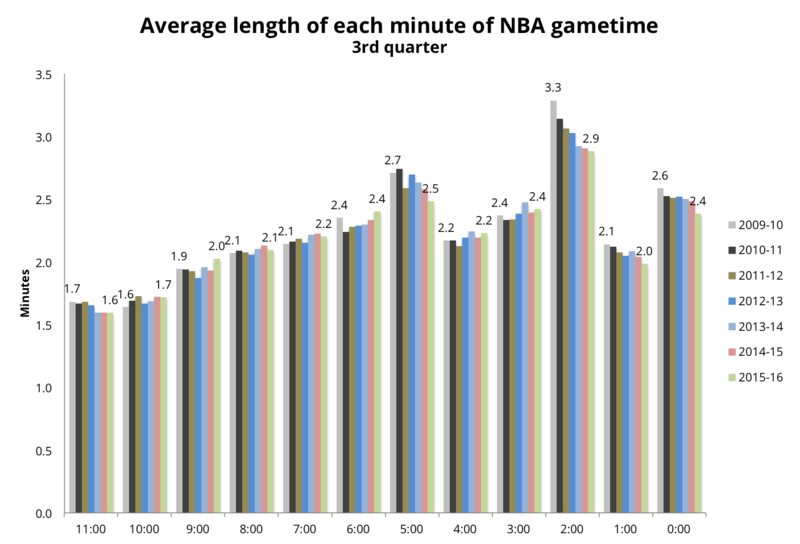 For both last season and this current season, games are averaging 2 hours and 15 minutes in length. In the 2010-11 season, games were three minutes longer on average, and the year prior, they were four minutes longer. Where did those four minutes go? Here is how average regulation game time allocates down to each quarter (and the breaks in between). The steepest decline shows up in the 1st quarter, though the 2nd and 3rd quarters show a drop too. 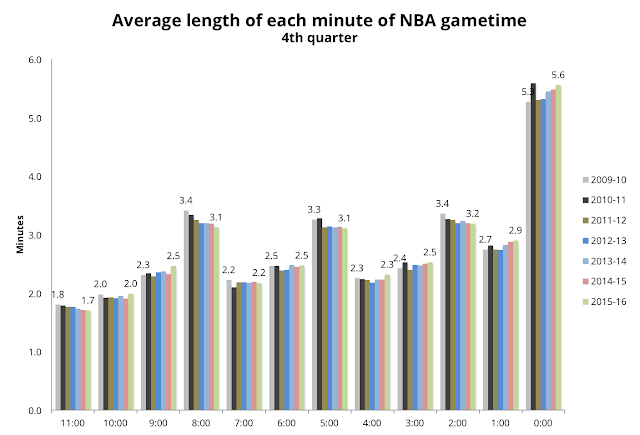 The 4th quarter trend is flatter overall, perhaps due to expanded use of instant replay. Note that halftimes are quicker as well, about 40 seconds quicker this season than six years ago. This decline appears to be driven in large part by nationally televised games. 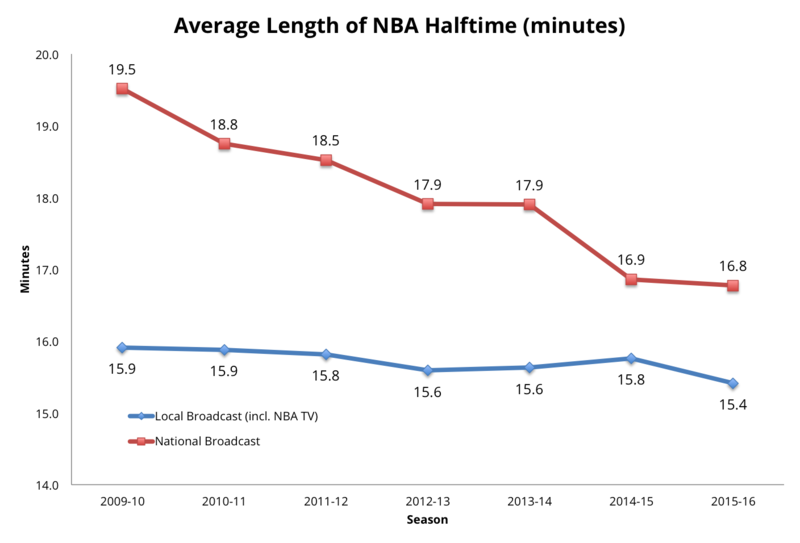 Broken down further by network, the steepest decline was for games on ABC and ESPN, which both declined by about 3 minutes, while TNT halftimes declined by about two minutes. For the 2015-16 season, ABC halftimes are averaging 16.6 minutes, ESPN halftimes average 16.4 minutes, and TNT halftimes are 17.4 minutes. According to the NBA rulebook, the official length of halftime is fifteen minutes. Note the spikes at minutes 5:00 and 2:00. Official NBA rules mandate that in the first quarter, a timeout be taken at the first available opportunity once the clock reads 5:59 - provided a timeout has not been taken prior to that point. If no subsequent timeouts are taken by 2:59, another mandatory timeout takes place. This is a topic for a future post, but the declines in average time for minutes 5:00 and 2:00 are related to coach-specific tendencies in timing of timeouts. Certain coaches, notably Spurs coach Greg Popovich, have a tendency to call a timeout just before the mandatory 5:59 and 2:59 cutoff, which, by rule, removes the need for a mandatory timeout. And this pattern seems to have caught on among an increasing number of coaches in recent seasons, driving a lower average time for minutes 5:00 and 2:00 (and higher average times for the minutes preceding). The same timeout rules apply for the third quarter. For the second and fourth quarters, an additional timeout is required in minute 8:00. 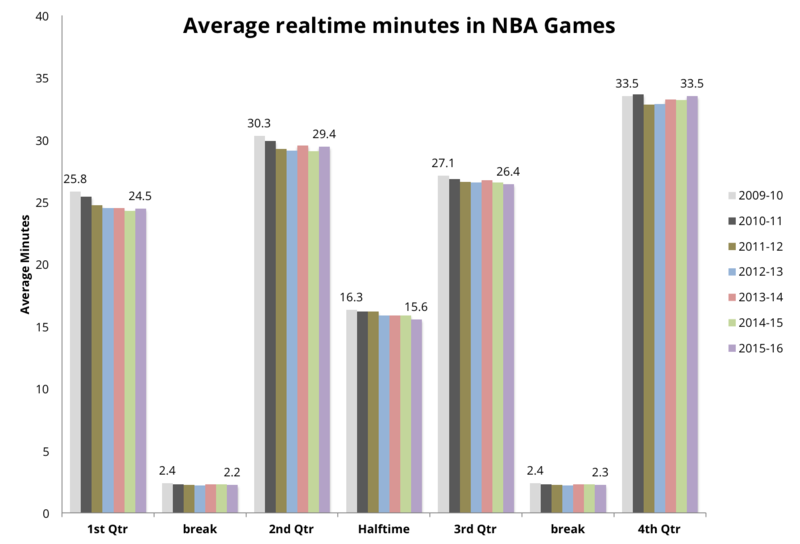 The next three charts break down minute by minute trends in game time for the next three quarters. The results are largely consistent with the first quarter results, though the final minute of the fourth quarter does show an upward trend. Always the longest minute of an NBA game, its average length has increased from 5.3 minutes to 5.6 over the past six seasons. If I had to tease a theme out of this data dump, it's that it appears the earlier phases of the game (both actual play and the breaks in between) are speeding up, but that is being somewhat offset by a slightly slower pace in the final two minutes.